Although school is still in session in many Northeastern States and it is hard to think about a rainy day in summer...(say what??? It's rainy Oh no..we can't go to the pool, the beach is out and everyone will be at the museums...I need some activities that we can do at home!!!) there will definitely be a day when in rains, I mean pours, I mean thunderstorm and hail...Summer Storms...Ya gotta love them or hate them. 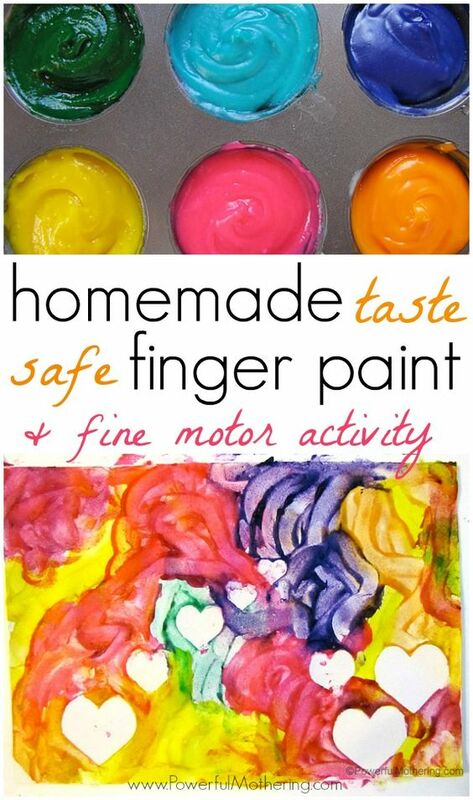 If this weather approaches, you DO need something for the kiddos to do while you are stuck inside the house. Well...Sunshine and Lollipops is here to save the DAY...that means that ideas are on the WAY! 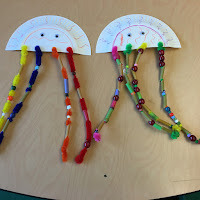 So...before I give you my BIG FUN Sea Creature IDEA, I am going to list some easy fun ideas that can be done on a rainy day or any day! These are tried and true ideas that I have used with my own kiddos in years past! I do think they are a bit better than being tethered to an electronic device all day!!! 1. 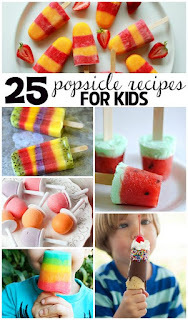 My kids and I loved making popsicles out of various juices...actually sometimes we used various sodas or pops, but in today's world that is a no...no...so here is a pin I found that gives you many ideas to chose from...Oh BTW if you have small paper cups and popsicle sticks from the craft store on hand,you will not have to use or use fancy molds and the kids can partially freeze and layer the pops. 2. Now this one is daring, but I did it with my younger kiddos, but you do need to be present and watching...well...I guess you need to present and watching for most of these ideas!! I used to have the kids get into their bathing suits and play in the bathtub with water toys. They LOVED it and it was almost as good as being in a pool...perhaps not quite as fun, but none the less a fun time in a pinch!!! Of course I would be right there watching and splashing with them!!! I have also "painted" with pudding, peanut butter, raspberries, blackberries and yogurt...Oh and if you want to add a little learning...give the kiddos sight words to write or sentences!! 4. Fruit and Veggie Prints: Cut some old fruit in half and dip it in paint. Then stamp it onto white paper, tee shirts, white napkins or pillowcases for some fun creating!! Apples, pears, oranges, peppers, celery,lemons, limes, orange sections,carrots and potatoes work great!! I am sure you can think of a few more!! i would suggest putting a fork through the top as a handle for stamping. There are so many examples on Pinterest that I decided to give you a link to all of them...WOW! 5. I have a zillion ideas, but this post would be way to long. 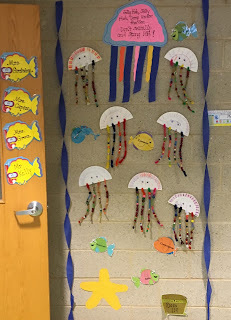 So...Now..it is time for the Sea Creature Idea...actually Jellyfish fun idea!!! First: You will need plain white paper plates cut in half with 4 holes punched across the bottom. 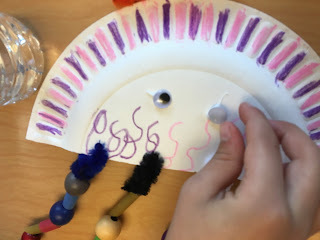 I used pipe cleaners and had the kiddos connect them to the paper plate by threading and twisting the pipe cleaners. You will also need an assortment of beads, macaroni/pasta, cut up straws and anything that you can find that has a whole through...buttons might work as well. 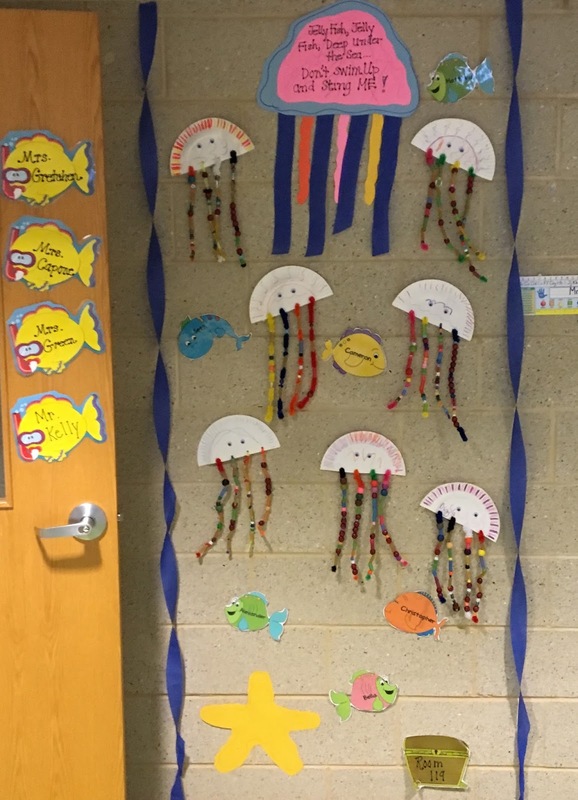 We also used google eyes, but beads or buttons work too! To add a sensory piece for Kinders I used the large fuzzy pipe cleaners, which you will see as the kids are working. Then they decorated the front of the paper plate (names on the back) and began to thread the beads and pasta onto each pipe cleaner. Everyone was able to do this...some with a tiny bit of help! BTW...you could have heard a pin drop during this activity...if you try this at home it MAY be a little different! Ha ha! 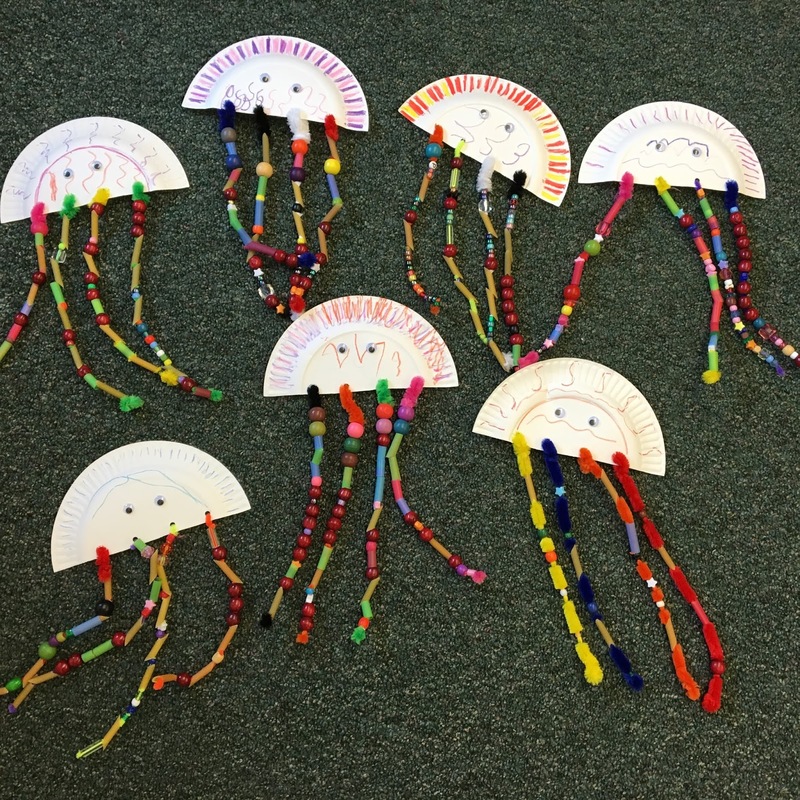 This is what we had...some VERY Cute Stingy Swirly Moveable Fun Jellyfish!! Hang from a light or the ceiling and decorated your child's Room or playroom!! I hope you have many sunny days this summer, but if you need a filler...Why not try one of these fun ideas??? Don't forget to comment with some of your favorite ideas! Love these rainy day activities!!! 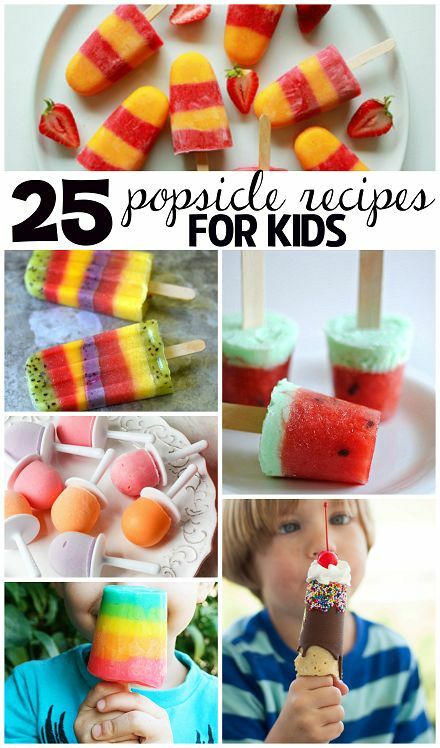 Definitely am going to try some Popsicles!!! Thanks Julie...Enjoy your summer...you deserve it!